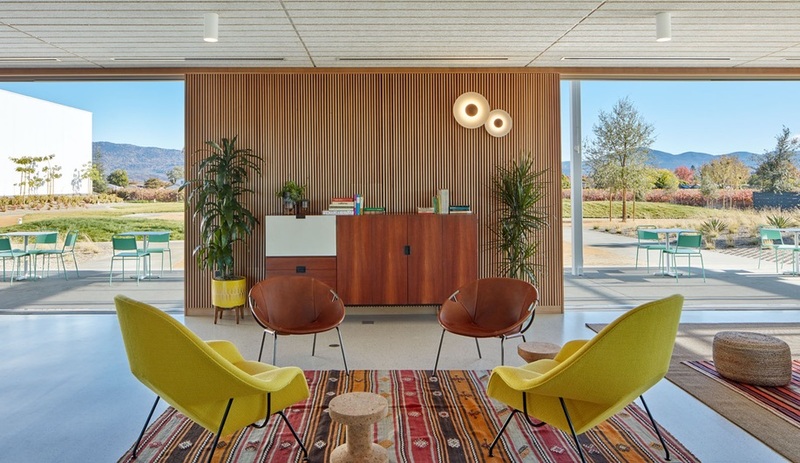 Bestor Architecture designed a production site and tasting room for Ashes & Diamonds, a Napa Valley winery, that is lovingly indebted to mid-century modern design. In the world of furniture, Eames, Knoll and Saarinen loom large. 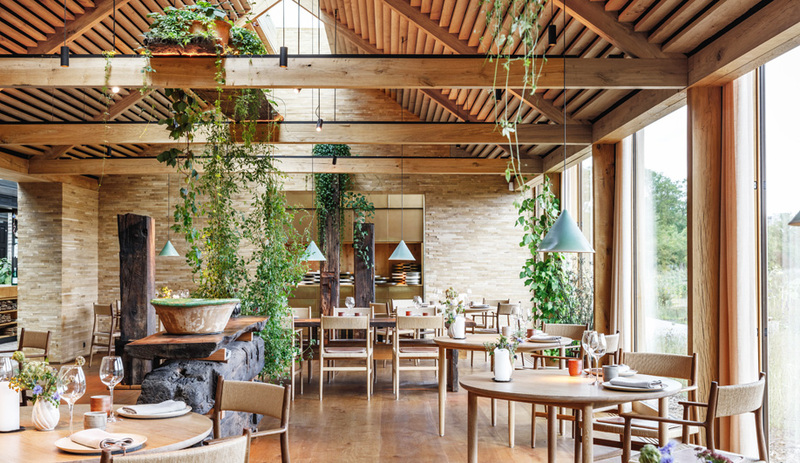 Indeed, many companies courting aspirational, design-savvy clientele – think: Article, Floyd, Elément de Base – draw inspiration from mid-century modern design, both for its beauty and its resonance with younger audiences. 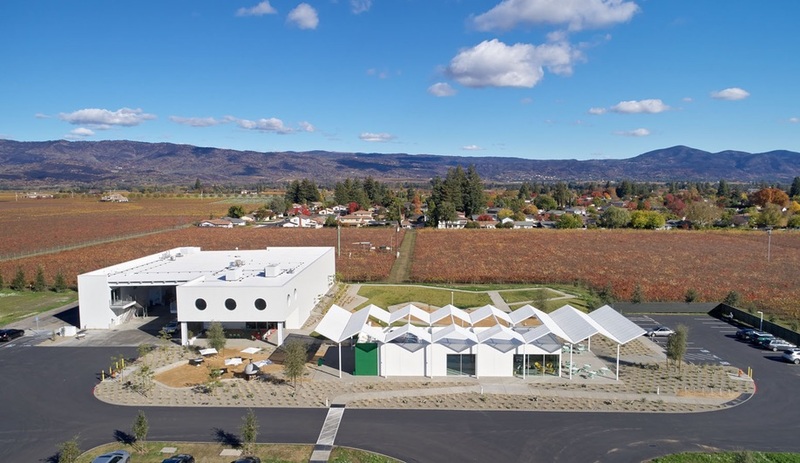 So when Napa Valley wine boutique Ashes & Diamonds wanted to attract a new generation of sippers, it took a similar approach: it developed a winery that leans lovingly on the likes of Rudolph Schindler and Donald Wexler. 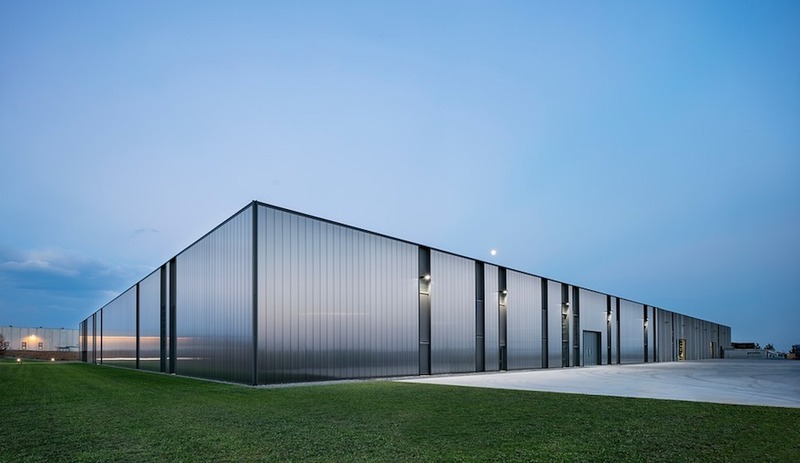 Designed by L.A.-based Bestor Architecture, led by architect Barbara Bestor, Ashes & Diamonds is part production facility, part hospitality environment – all completed on a modest budget. 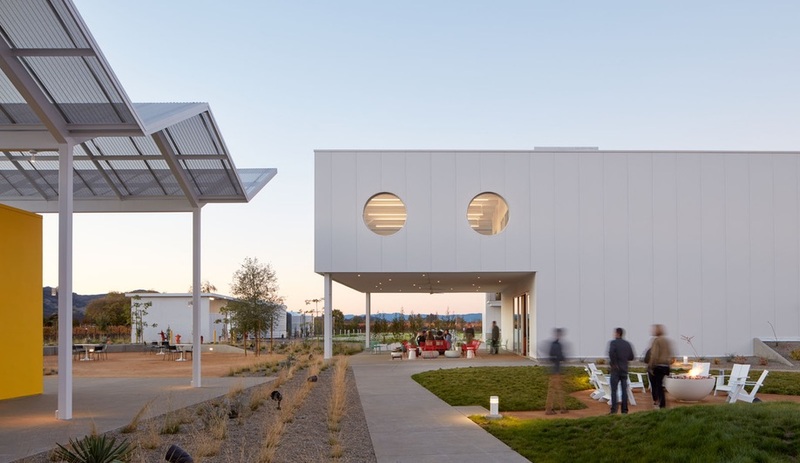 Bestor conceived of a 12-hectare indoor-outdoor facility that relishes in Napa County’s mild climate, rolling green hills and plentiful vineyards. 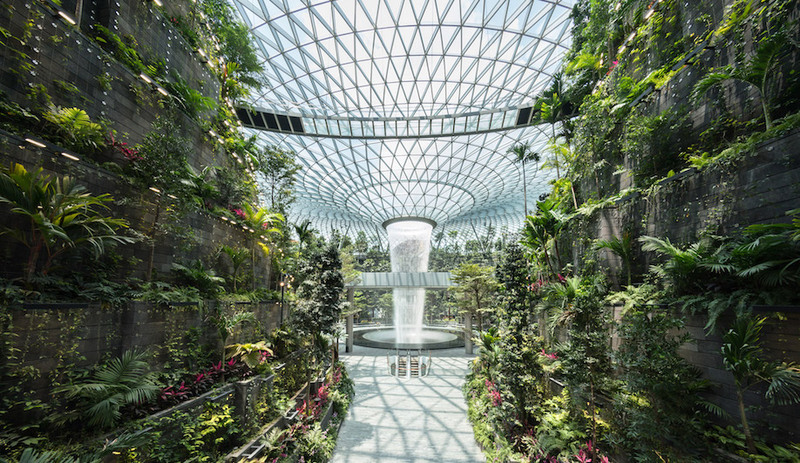 The site features a two buildings tied together by a courtyard that is defined by zigzagging footpaths. 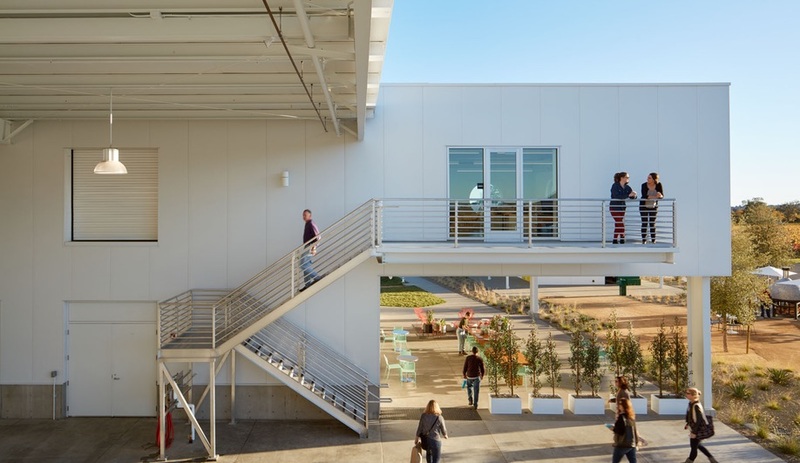 The client tasked Bestor with keeping visitors top-of-mind; it wanted to develop as many gathering spaces as possible. 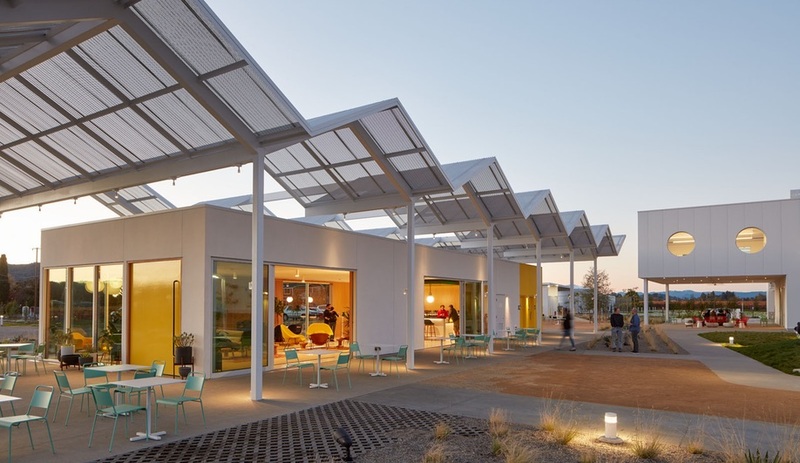 The bulk of the public-facing areas are contained within the hospitality building, a boxy volume shaded by a striking canopy (above left), a clear nod to Wexler’s residential roofs. Yet this isn’t a folded-plate roofline, which Bestor says would be costly. 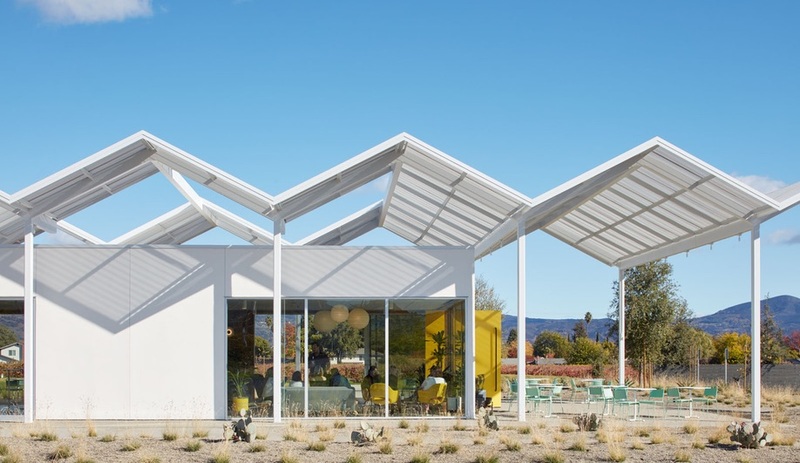 It’s made from custom corrugated, perforated metal panels, providing “interplay of light and shadow.” The roof encloses both indoor and outdoor hospitality spaces below,” says the firm. “It provides a skeleton and frame for lighting and screens the flat roof below.” On axis with the site’s driveway, the hospitality building is first thing visitors see as they arrive at Ashes & Diamonds. The tasting room itself is a wood-framed stucco box, which the architect describes as a “simple container for a more luxurious interior.” With generous sliding doors that open onto plentiful patio space, the room was designed to resemble a living room: the walls are lined with vertical-grain Douglas Fir pinewood, while ceiling-mounted Tectum acoustic plates help moderate sound levels. Flooring and a custom-made tasting bar, featuring an integrated tabletop and foot rest, are made from terrazzo. Barrels of wine are stored adjacent to the tasting room (below). 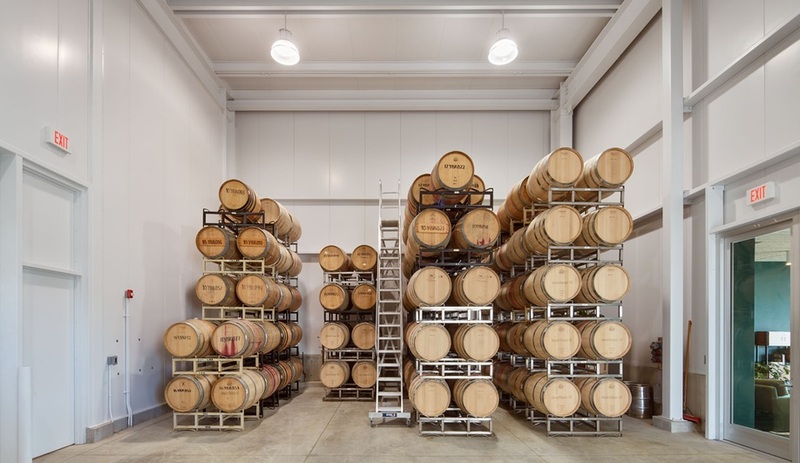 The production facility is no less handsome, even if it’s built for serious winemaking – spread over nearly 20,000 square feet, it’s capable of producing 10,000 cases of wine annually. 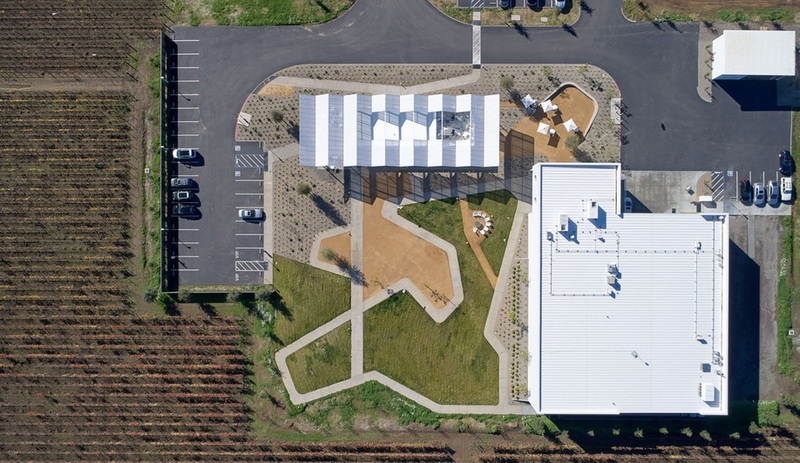 The pre-engineered building’s exterior is firmly industrial, clad in insulated metal panels, and it’s defined by a row of portholes, which provide staff with views of the nearby vineyards. There’s public gathering space available here, too. A cantilevered second-storey volume (which the architect aptly describes as a “cobrahead”) provides a shaded terrace which is used as an intimate extension of the tasting room. Here, visitors will find trees, café seating and a pizza oven. 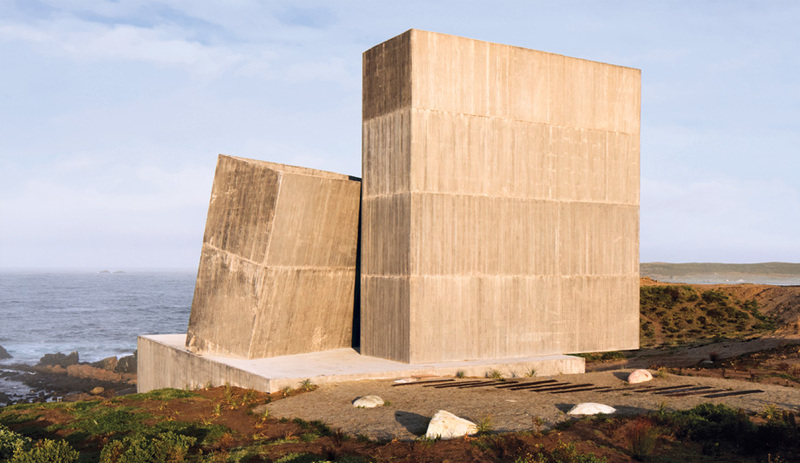 Like the rest of the site, two things invite visitors to stay a moment longer: the wine, of course, and the California sun.